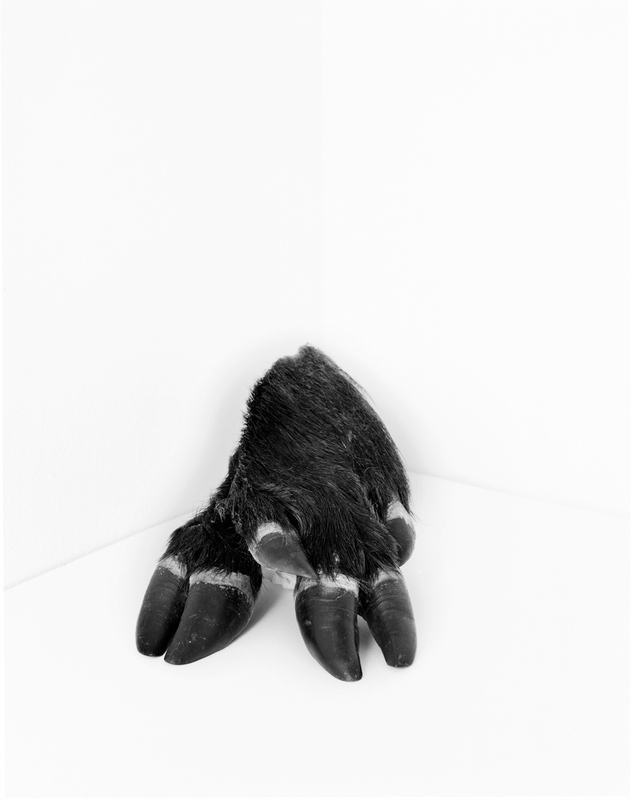 The photographs in this posting highlight the conceptual diversity in contemporary art practice and emphasise the talent of the practitioners working today. Just an observation: how serious are the portraits – it’s as if no’body’ is allowed to laugh or smile anymore. Perhaps this is a reflection of the times in which we live, full of malaise, anxiety and little wonder. Fear of being replaced, fear of discrimination, fear of growing up, fear of dying. Or dressed up in a women’s dress and pink hat, having the “courage” or ignorance (the opposite of fear?) to look like a stunned mullet with a blank expression on the face (deadpan photography that I really can’t stand). Or, perhaps, simple effacement: defiance as body becomes mannequin, body hidden behind a mask or completely cloaked from view. These grand photographs have the intensity, perhaps not a lightness of being. 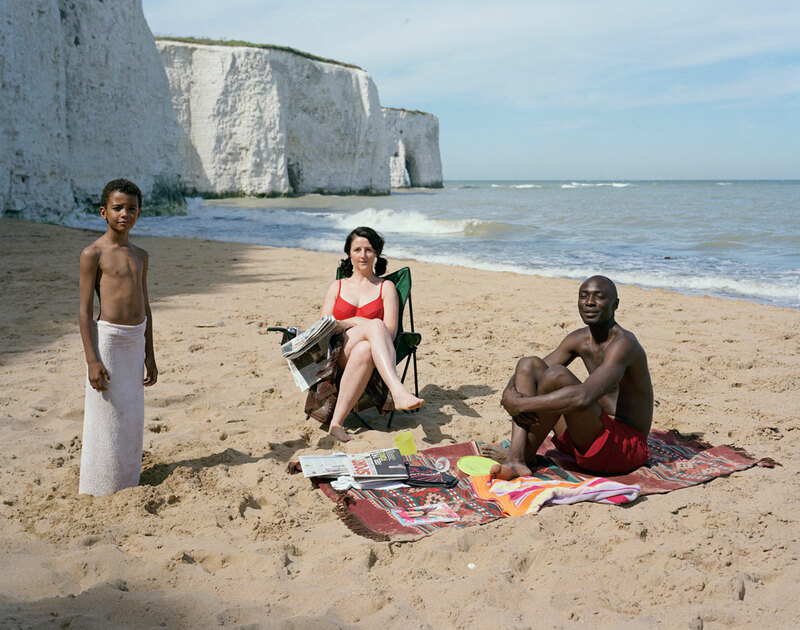 “Front deals with the notion of borders, boundaries and the edge; using the family group and the beach setting as metaphors. For this work, the artist travelled to beaches in the UK and around Melbourne. There, she approached families and groups of friends who had made temporary encampments, or marked out territories and asked if she could be part of their family temporarily. Morrissey took over the role or position of a woman within that group – usually the mother figure. The artist asked to take the place of themother figure, and to borrow her clothes. The mother figure then took over the artist’s role and photographed her family using a 4×5 camera (which Morrissey had already carefully set up) under the artist’s instruction. While Morrissey, a stranger on the beach, nestled in with the mother figure’s loved ones. “The term ‘Sistagirl’ is used to describe a transgender person in Tiwi Island culture. Traditionally, the term was ‘Yimpininni’. The very existence of the word provides some indication of the inclusive attitudes historically extended towards Aboriginal sexual minorities. Colonisation not only wiped out many Indigenous people, it also had an impact on Aboriginal culture and understanding of sexual and gender expression. “St Mary Street is one of the main streets in central Cardiff, the capital city of Wales; a city as any other in the UK. Unassuming during the day, on weekend nights it becomes the main scene of the city night life, fuelled by alcohol and emotions. Some of Cardiff’s most popular clubs and pubs are located there or in its vicinity. The very popular Chippy Lane, with its numerous chip and kebab shops, is just a stone’s throw away. Sooner or later most party-goers end up in that area, whether looking for another drink, some food or in search of another dance floor. “…Artists are notorious for their ability to hijack; meaning to stop and hold up, to seize control by use of force in order to divert or appropriate, a deliberate attempt to action a change of direction. Hijacked III: Contemporary Photography from Australia the UK draws on the success and unique energy of Hijacked I (Australia and USA) and Hijacked II (Australia and Germany), to once again bring together two geographically distant but historically connected communities through a range of diverse photographic practices. This exhibition will be simultaneously presented across two sites: PICA in Perth, Western Australia and QUAD Gallery in Derby, United Kingdom, and has been timed to coincide with the launch of the luscious, full colour and 420 page Hijacked III compendium, published by Big City Press. Utilising portraiture, digital collage, archival images, documentary snap shots, internet grabs and refined photographic tableaux, the 24 artists and over 120 works in this exhibition explore themes as diverse as curious weekend leisure pursuits, gender politics and displaced Indigenous culture. 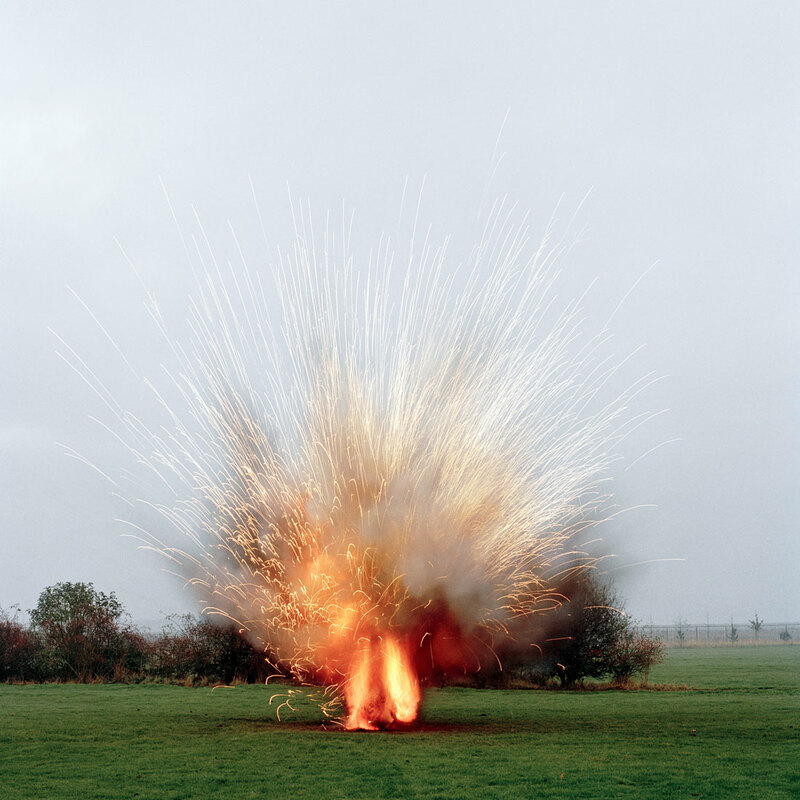 “The Explosion pictures document the literal theatre of war – the detailed level of artifice used to prepare men and women for combat on the front lines. They also reveal the minutiae of packaging war as entertainment. The beauty of the pictures lies in their perverse seductiveness, and this attraction underscores the distance most of us have from real combat. Pickering’s Explosion images, by distilling an aspect of the war that is a fiction, question the reliability of seemingly objective historical accounts, such as news reports and photographs that influence how war is communicated and remembered. By extension they question how we come to know what we know about it. We learn about war from a variety of sources, from history books, first-hand accounts, news media, and movies, all of which can get confused and merged in our minds as memory. “Tony Albert is a Girramay rainforest man from the Cardwell area… The No Place series references The Wizard of Oz ‘there’s no place like home’. 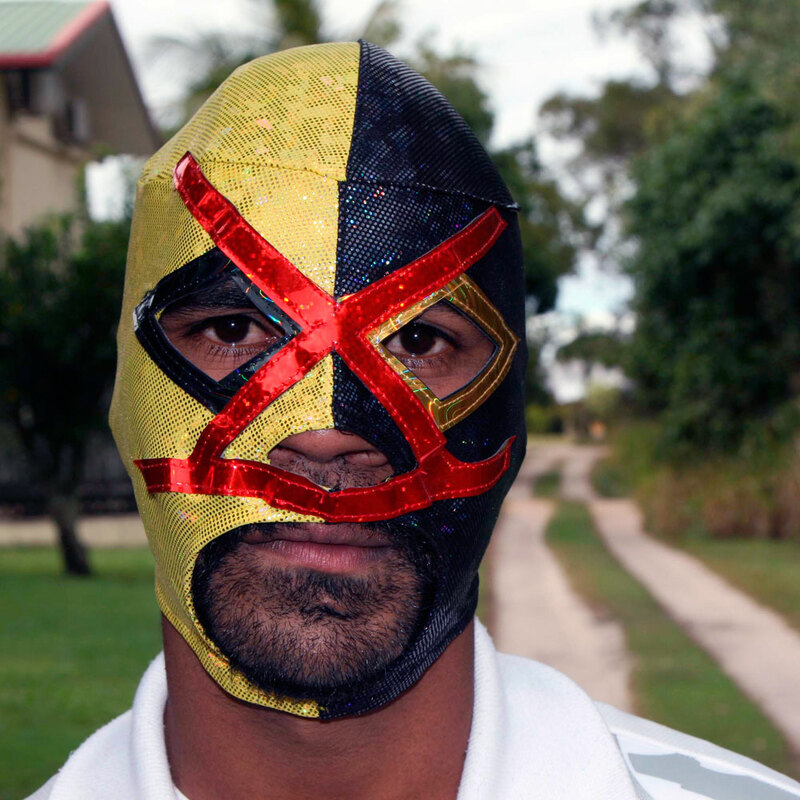 For No Place Tony returns to his tropical paradise home with a group of Lucho Libre wrestling masks from Mexico. His family adorn these masks and again become warriors protecting their paradise. These seemingly playful masks share much with Aboriginal and particularly rainforest culture. Body and shield designs from this area represent animal gods or spirit beings. 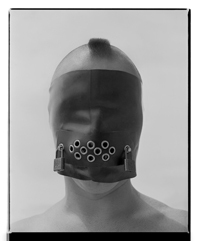 The use of these masks brings a prescient new layer of armor for a new generation of warrior. “King Billy, is an ode to his great great grandfather, King Billy of Bonnie Doon Lorne. The initial inspiration was a photograph of King Billy, standing alone wearing his ‘name plate’. Despite its colonial overtones, for Thompson, this image of the senior tribesman exudes wisdom and kindness and reminds him of his father. In much of Thompson’s work his processes are intuitive, he delves into a rich dream world and draws out fabulous images. He manifests his own mythological world. 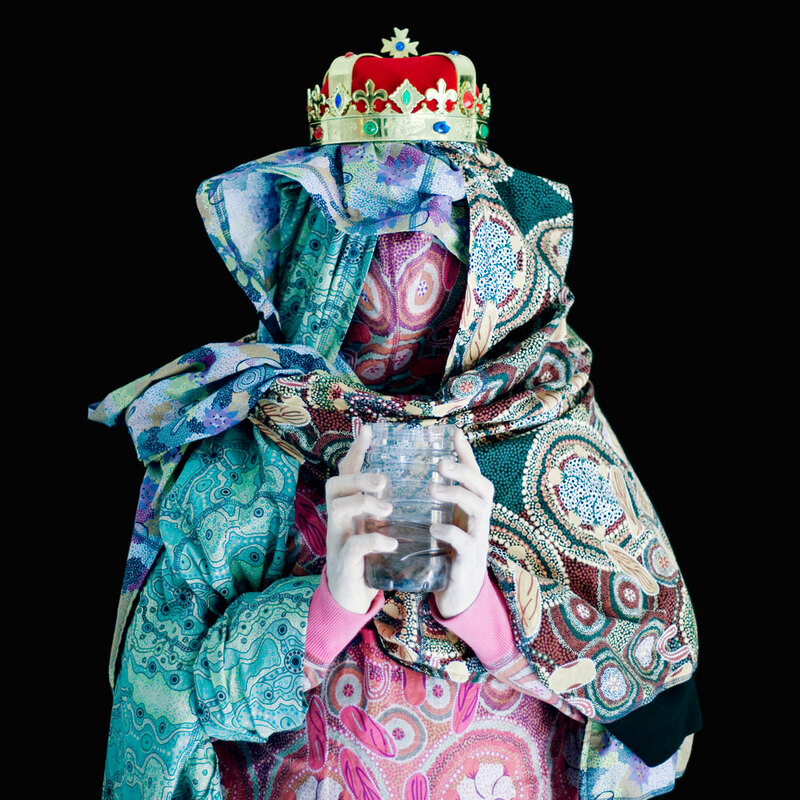 In this series his figures are clad in fabrics patterned with Indigenous motifs, mainly cheap hoodies in lurid colours; a modern/ ancient skin for a magic youth culture. He has made a triptych, three views of a pink hooded figure spewing cascading pearl stands from the face; opulent, decadent, excessive and sensual. Another image shows a crowned figure swathed in fabrics bearing the markings of various clans, perhaps indicating the domain of this regal form. In the hands a (poisoned?) chalice – the sawn off plastic bottle a warning about petrol sniffing? His self-portrait as psychedelic godhead/Carnaby Street dandy/flower child is spectacular and arresting. He is wearing a tailored suit, patterned with more Indigenous motifs and he cradles a bouquet. His skin is green and his eyes are purple flowers. What can this otherworldly creature tell us? 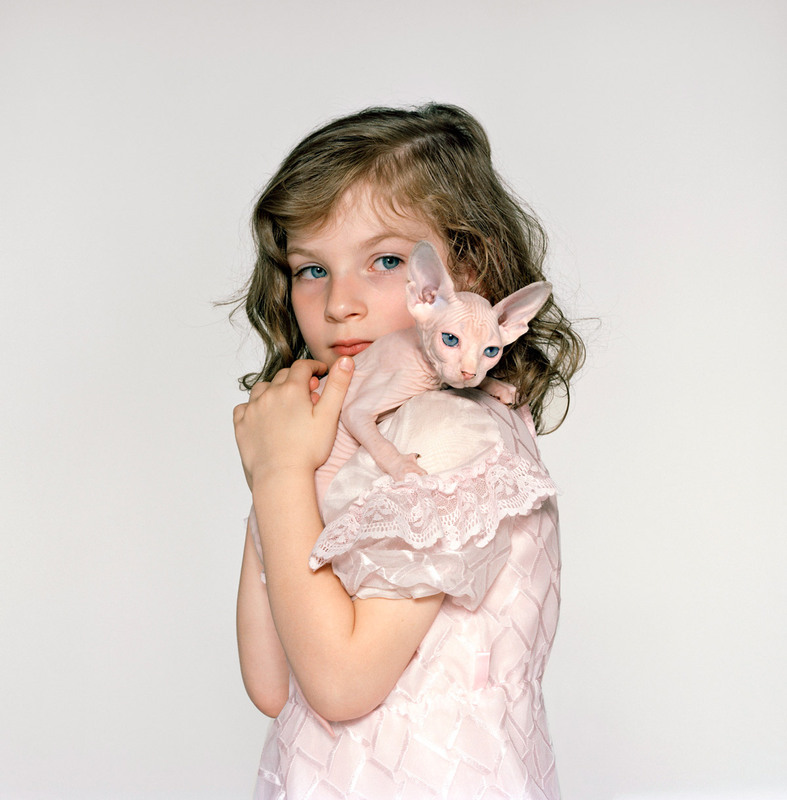 “Petrina Hicks’ Beautiful Creatures appeals to our senses. Immediately alluring, the large-scale, hyper-real photographs, are all rendered so clearly and with such control they are reminiscent of advertisements. But with a series of little ruptures, within images and between them, Hicks disrupts our usually beguiled response to such artistry. 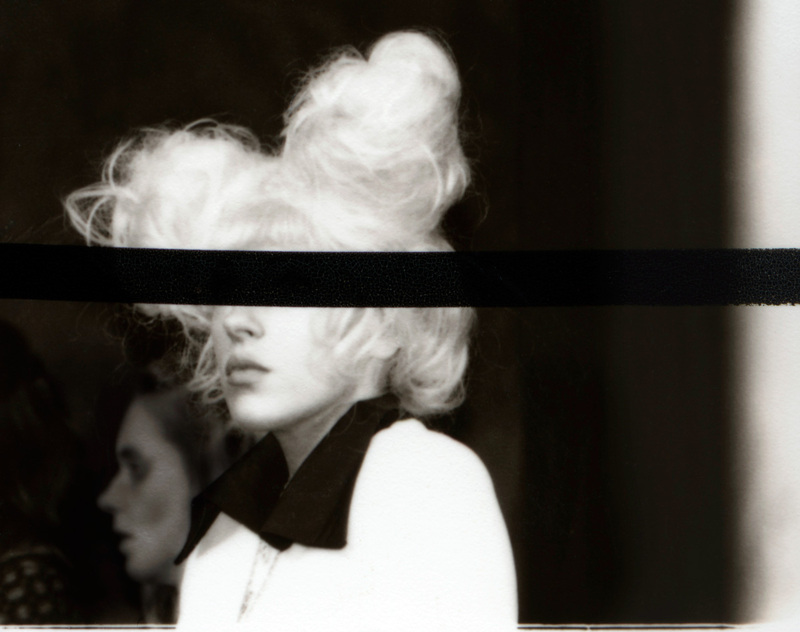 For her, photography’s capability to both create and corrupt the process of seduction and consumption is of endless interest. 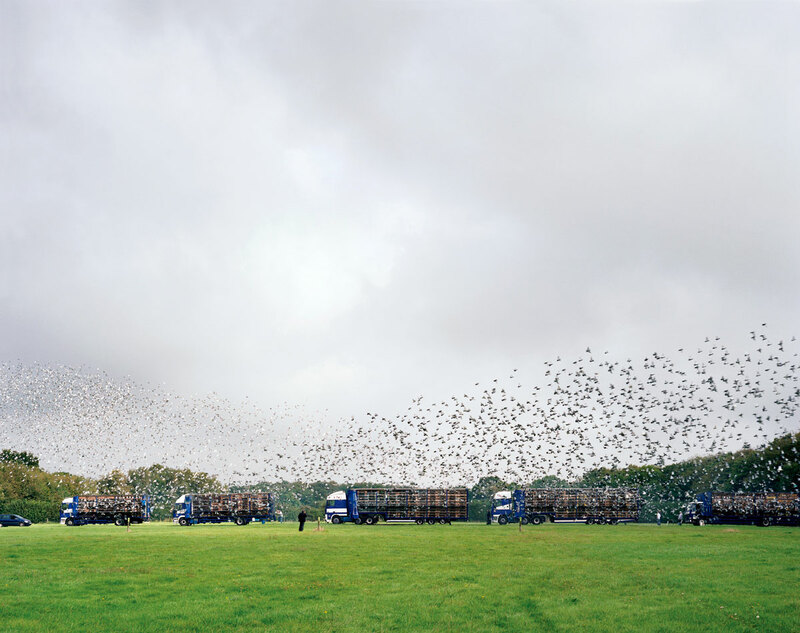 “Stephenson finds birds and the world surrounding them wonderfully fascinating. The birds he has photographed all belong to avid bird breeders who on the whole have been keeping birds their whole lives. It’s a hobby people generally don’t come into contact with, unless you are active within it. 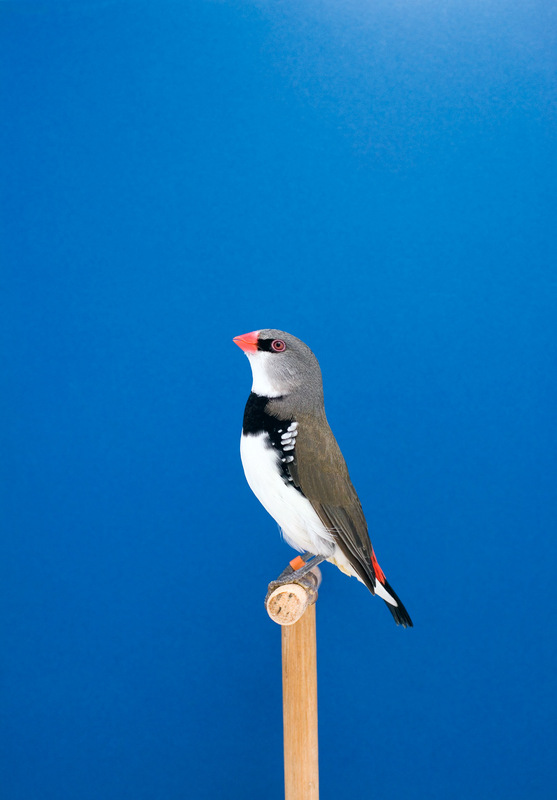 The artist does not keep birds but finds them beautiful in all their variations and colours, so has set out capture these birds in a way that would show them at their best.